Researchers are finding out that animals might have the emotional complexity for artistic expression as well. There is no commonly agreed upon definition of what exactly art is. Creativity and aesthetic appeal are commonly accepted aspects of art. While art is about beauty, artists also enjoy the commercial benefits of creating art. When considering the artistic abilities of animals, the definition for what is art to an animal might be completely different. For example, researchers may not consider songs of birds as music, because they do not follow human scales. There are other reasons why songs of birds, while known to be aesthetically pleasing, are not considered art. Most songbirds do not sit down and compose their own music. They learn it from the previous generations. However, there is an exception – the Lyrebird. This species of bird listens to the songs in its environment, and remixes them into a new song, which it sings to attract mates. At times, the bird incorporates sounds of human activity into its songs as well – chainsaws or human-made music. An investigation into the vocalisations of the Australian magpie showed that the bird would sing even when they are alone. These songs cannot be explained by any other function – either of reproduction or territorial defence. The magpie is singing purely as a form of self-expression. Additionally, the magpies attach a signature closing phrase, that is unique to each individual. Researchers have also found evidence to suggest that the ever-mutating songs of the humpback whale are driven by a creative process – rather than constrained by any function. David Nyzio is an American artist who showcased a number of artwork created with the help of animals in his show titled “Smoke and Mirrors”. An arch was crafted using stumps that had been chewed by beavers. There were also fifteen pieces of salt that had been licked by sheep which resulted in various shapes and forms. A number of artists have collaborated with the industrious bees to create sculptures. Aganetha Dyck, a Canadian artist, makes bees build hives around porcelain figurines and sports equipment in apiaries. For his “Yuansu Project” exhibition, Ren Ri, a Chinese “biomedia” artist showcased a number of sculptures created with the help of bees. The process involved carefully placing the queen bee at a strategic location, and then moving her so the bees would build around the queen. Tomas Libertiny, another artist who uses bees as a 3D printer, has produced hives in the form of vases. The bees were introduced inside wooden scaffolds of the requisite shape. Once the hive was constructed, the scaffolds were removed. The process took between two to ten days to create each honeycomb vase. 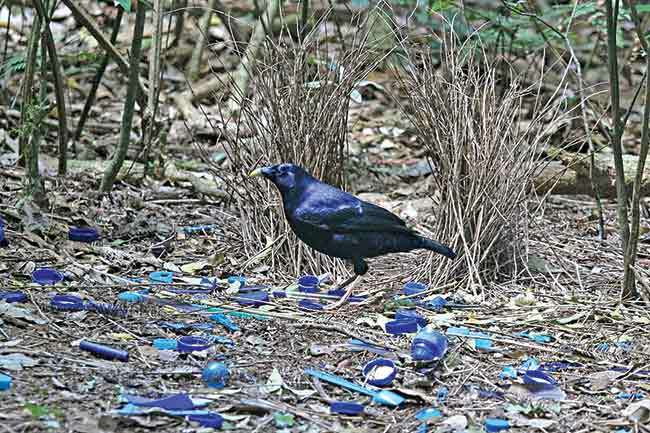 The Bowerbird is perhaps an example of a true natural artist. The nest itself is a structure meant only as a sculpture to attract mates and is not actually lived in. Additionally, small bits of plastic, shells, leaves, flowers, sticks and stones are used to decorate the nest. The bird uses its own saliva and naturally available pigments to paint the interiors of its nest. Once a mate is attracted, the nest is abandoned. 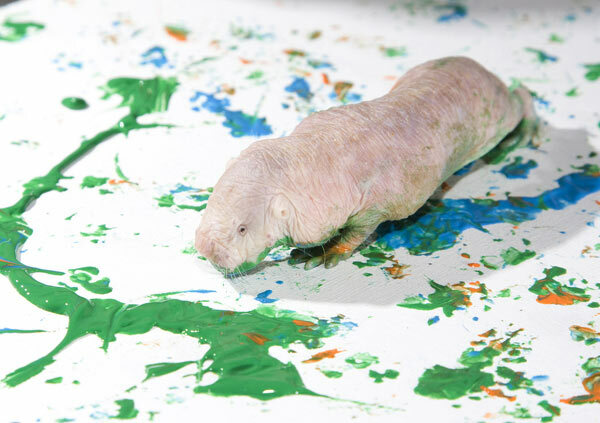 Smithsonian’s National Zoo introduces non-toxic paints to animals as part of enriching activities designed to provide stimulation and improve their quality of life. A wide variety of animals have produced paintings, including mole rats, red pandas, tamarins, armadillos, pangolins, toucans, kiwis and even lions. The artwork produced by these animals have been sold in shows, to raise funds. The zookeepers noted that the animals had a choice to participate in the activity, and when they chose to do so, that they were enjoying it at some level. Elephants are trained to paint, in Thailand. This is, however, only for the purpose of entertaining the tourists. The elephants are guided through the process by Mahouts who convey signals using the ears of the elephants. The elephants typically paint the same painting over and over again, which are then sold to the tourists. One elephant – Paya – is said to have mastered the art of self-portraits. Conservationists allege that buying the paintings can harm the animals, as the elephants are likely to be abused during the training process. Among the most notable animal painters are chimpanzees. Congo the chimpanzee found a fan in none other than Pablo Picasso, and actually outsold Renoir and Warhol at an auction. The paintings by Congo were better than paintings by other chimpanzees. He would balance out shapes across the canvas, and make sure that a single colour did not dominate a particular area. He would throw fits if the painting was taken away from him in an unfinished state, and would refuse to paint further after finishing a work. Washoe, also a chimpanzee, was the first non-human life form to be taught the American Sign Language. She would at times, describe what her paintings represented, through the use of signs. Moja was another chimpanzee who could use the sign language. A human companion was allowing her to draw. When Moja walked away, her companion saw that the paper was not filled up, and signed her to “draw more”, so as not to waste paper. Moja, at this point, indicated that her drawing was “finished”. When the human asked her what the drawing was, Moja replied that it was a “bird”. Koko was a Gorilla who had famously adopted a kitten and named him “All Ball”. Koko liked to paint too and often explained what the paintings represented. “Bird” is a painting of a bluebird that used to visit Koko often, and liked to sit on her shoulder. One time, Dr Patterson, an American animal psychologist asked Koko to represent “love” in a painting. Koko chose to express the emotion using the colours of pink and orange, from a wide palette of colours. The resulting image is also vaguely heart shaped. Michael, another gorilla who could paint and sign was asked to paint his toy dinosaur. After painting, Michael pressed the painting to the textured floor to create the scales of the dinosaur. 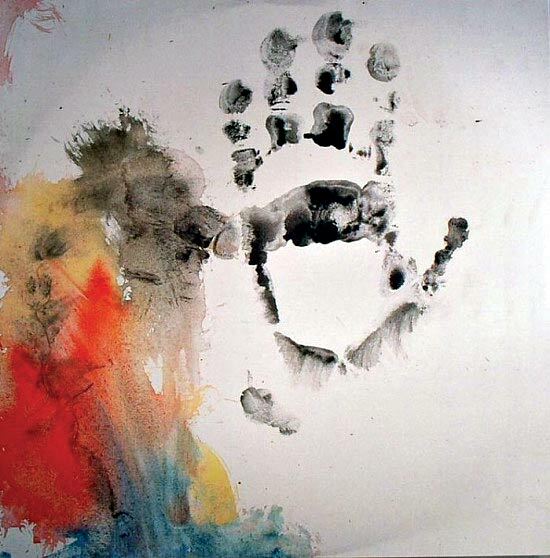 He also painted a self-portrait called “Me, Myself, Good”, and as an autistic student noticed next to the prominent handprint, the painting can be interpreted as a profile of a sitting gorilla. When one of Koko’s companions provided a lukewarm compliment to one of her paintings, the gorilla signed the word for “toilet”. This showed that Koko had some kind of understanding about the aesthetic value of her creations. Experiments have shown that creatures do have the skills to appreciate art, and they are not restricted to higher primates. 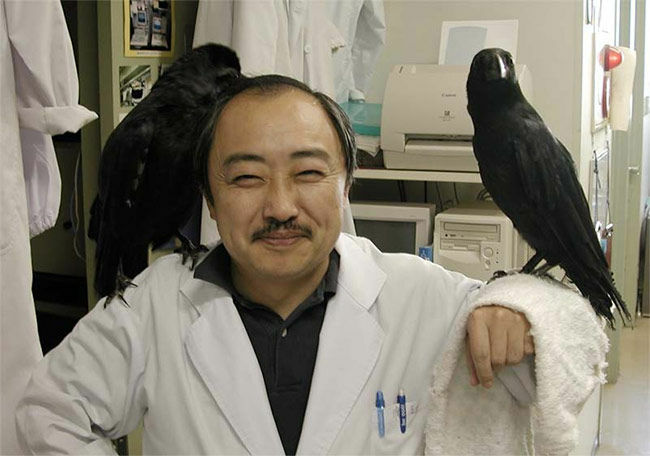 Shigeru Watanabe has performed a series of interesting experiments to find out if pigeons can be trained to appreciate art. One experiment involved collecting a series of children’s paintings and having them classified as “good” or “bad” by adults. Then, the pigeons were shown the same series of paintings and were rewarded with grain when they selected the “good” paintings, but not when they selected the “bad” paintings. All 22 pigeons in the experiment successfully learned to pick out only the “good” paintings. They were able to pick out the good paintings even when shown pictures that they had not been shown before. Further, the pigeons were presented with the paintings in a reduced size, in greyscale and with a mosaic filter applied. The pigeons performed well with reduced sizes, not so great in greyscale and their abilities deteriorated with increasing amounts of distortion with the mosaic filters. In another experiment, the pigeons were trained to successfully differentiate between the paintings of Picasso and Monet. The pigeons could not identify upside-down images of Monet but could do so for Picasso. This indicated that the pigeons were tracking the objects in impressionist paintings, but were not following the same approach for cubist paintings. Who would have thought pigeons could learn to differentiate between two artists?